Sat, Jul 21, 2018, 07:50 pm SL Time, ColomboPage News Desk, Sri Lanka. 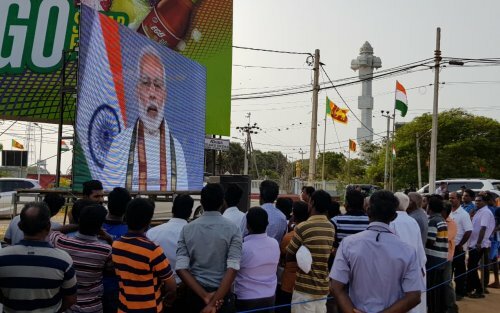 July 21, Jaffna: Prime Minister of India Narendra Modi joined Sri Lankan Prime Minister Ranil Wickremesinghe through a live video conferencing from New Delhi for the launch of the island-wide expansion of the 1990 Suvaseriya Emergency Ambulance Service in Jaffna on Saturday, 21 July 2018. 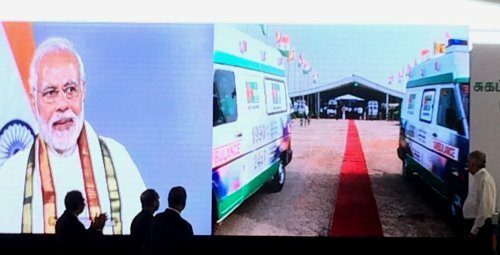 Sri Lankan Prime Minister welcomed his Indian counterpart Prime Minister of India Modi to launch the free Emergency Ambulance Service, which was made possible by India consolidating Sri Lanka's free health service. High Commissioner of India to Sri Lanka, Taranjit Singh Sandhu was also present. Speaking on the occasion, Prime Minister Narendra Modi expressed happiness that the promise he had made, for expansion of the ambulance service island wide in Sri Lanka during his visit last year, was now fulfilled. "This event marks another major achievement in the development partnership of India and Sri Lanka," the Indian Premier said. He noted that the event marks another major achievement in the development partnership of India and Sri Lanka. He underlined that India sees Sri Lanka not just as a neighbor but as a very special and trusted partner in South Asian and Indian Ocean family. Noting that the expansion of the service island wide started from Northern Province, he said that India was happy to work together with Sri Lanka for wiping tears from the past and ushering in a bright future. He noted that the local skill set and local employment in Sri Lanka will receive a boost with the expansion of the service. Fondly recalling his last two visits to Sri Lanka Prime Minister Modi highlighted that India had been and would always remain 'the first responder' for Sri Lanka, in both good and bad times. Prime Minister Modi appreciated the efforts of President of Sri Lanka Maithripala Sirisena and Ranil Wickremesinghe for meeting the aspirations of all citizens of Sri Lanka. Prime Minister Modi recalled what Mahatma Gandhi had said in 1927, when he had visited Sri Lanka at the invitation of the Student Congress of Jaffna- "The message that I can leave for Jaffna as for the whole of Ceylon is: let it not be out of sight, out of mind". Prime Minister Modi said that he has the same message today. He exhorted people of India and Sri Lanka to be in touch with each other, so that they could know each other better and become even closer friends. He encouraged people of Sri Lanka to come and experience the New India that is taking shape. Prime Minister Ranil Wickremesinghe thanked Government of India for the generous assistance, and noted that this was an important milestone in the India-Sri Lanka bilateral relationship. Prime Minister Narendra Modi and Prime Minister Ranil Wickremesinghe together flagged off the first two ambulances. 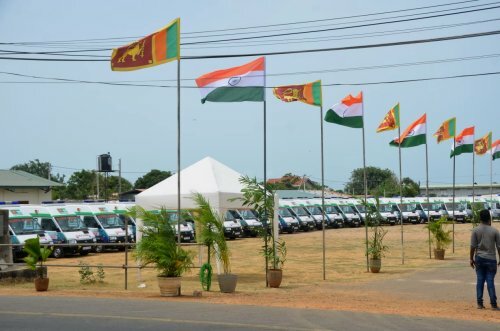 The Emergency Ambulance Service was first launched in 2016 in Western and Southern Provinces of Sri Lanka under an Indian grant of USD 7.5 million. This grant included purchase of 88 ambulances, operational expenditure of the service for one year and setting up of an emergency response center. This service is now being expanded to the remaining seven provinces with an additional grant of USD 15.02 million, covering the cost of 209 ambulances, training costs and operational expenditure for one year in all seven provinces. The emergency ambulance service, which can be obtained by simply dialing toll free no '1990' on any network in Sri Lanka, is the largest Indian grant project in Sri Lanka after the Indian Housing Project. India remains committed to further strengthening the bilateral partnership with Sri Lanka based on Sri Lanka's own choices and priorities.